itoes during monsoon season, lots of folks rely on hit-or-miss citronella candles to combat mosquitoes. Lady Bug Pest Control offers a mosquito treatment (natural with a garlic base) that lasts three to four weeks guaranteed! Try it for the special price of $99 (up to ¼ acre). With West Nile virus a longtime concern, and now Zika, what better time to protect yourself and loved ones? As for termites, homes either have them or they’re going to get them! But did you know when building a house (it will work with a major remodel as well), the Lady Bug team has a way to protect wood framing from termite damage? Brave termites that aren’t repelled by the product will die once they take a bite! Comes with a 10 year warranty. If it fails (hasn’t yet!) not only will Lady Bug retreat but they will repair termite damage. Try the wood protection treatment for a limited time with $50 off. Bedbugs don’t stand a chance against the high-heat process Lady Bug uses. Spraying may not reach bedbugs hiding under baseboards or in walls … “slow cooking” will. Miller even brings in the dogs, the bedbug-sniffing dogs, to assure NONE are left. 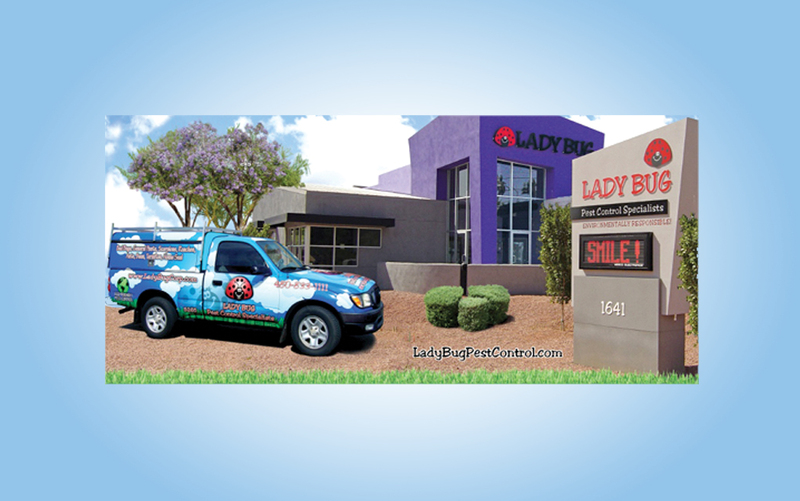 The professionals at Lady Bug Pest Control Specialists are thorough, effective, natural/organic and highly regarded. They believe in being proactive and offer home seals – keep out scorpions before they sneak in. No long-term contracts required! See more of what Lady Bug can do at ladybugpestcontrol.com and then call 480-833-1111 to schedule an appointment. Right now, new customers can receive $20 off first pest-control service.